In Windows 10, managing a wireless network is quite easy. Microsoft has made sure that their flagship product is as user-friendly as possible. They have life easier by incorporating the Wi-Fi option in Network and Security part of the Settings app. However, there are few steps that need to be taken for connecting to a wireless network depending on the security or nature of the network you are trying to connect to. You can manage all aspects of your wireless connection i.e. connect or disconnect from a wireless network, add or remove connections, view the properties, set up a metered connection and edit the network profile, etc. 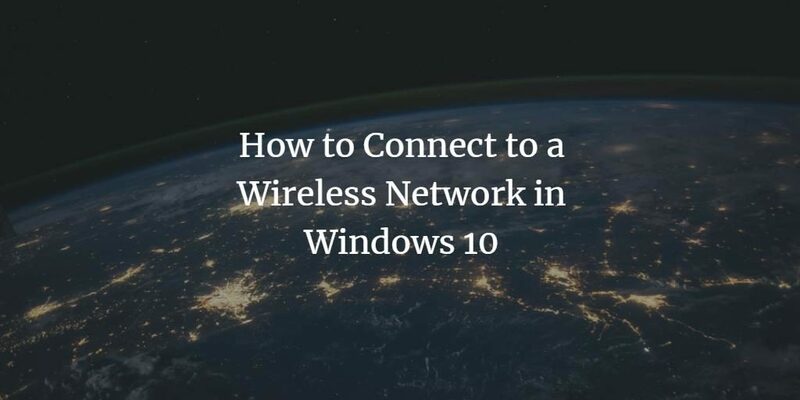 In this tutorial based post, we will teach how to connect to a wireless network, step by step, in Windows 10. Step 1: In the notification area (right-side of the taskbar), click on the Wi-Fi icon. It is the one with a dot and quarter of a three radii circle. Note: If you cannot find the icon then press the ‘Windows’ key and ‘A’ key, simultaneously, to open the Action Centre. If you still cannot locate the icon then click on ‘Expand’ to see all the options and enable Wi-Fi. You can also reach this particular page by going to the start menu and typing ‘Settings’. Click on the app icon. A window will open. Click on ‘Network & Internet’ option and select the ‘Wi-Fi’ option from the left panel. Step 2: A menu will open-up with the names of all the available networks in your area. Click on the network you want to connect to. Step 3: Click on the button with ‘Connect’ label. Step 4: After checking network requirements, the network will ask for the Wi-Fi password. A field will appear with the label ‘Enter the network security key’. Add the key in the field and select the button with the label ‘Next’. The network status will change to ‘Connected’ after verification of the key. Step 5: At this point, you can make your PC discoverable by other devices on the network. Click on ‘Yes’ if it is a trusted network of home or workplace, else click on ’No’ for public connections. Step 1: Open the ‘Settings’ app by clicking on it from the Start Menu. Go to the Network & Internet option and click on Wi-Fi option. Step 2: Click on the wireless connection you are currently connected to. Step 3: Enable the radio button beneath ‘Connect automatically when in range’. Note: You can also change the Private or Public status of your connection on this page. Step 1: Click on the Wi-Fi icon from the notification area. A menu will open. Step 2: Click on the wireless network you are connected to and then select the button with the label ‘Disconnect’. Connecting and disconnecting of wireless networks is a simple and easy process in Windows 10. In this post, we talked about how to carry these activities out on known networks. You can also connect to hidden networks in a similar manner with an addition of a few steps thanks to Windows 10’s easy to find Wi-Fi options in the settings app. [Solved] Verification of prerequisites for Domain Controller promotion failed.